I've dedicated some time to a long-neglected project around our place: re-vamping the art that hangs on our walls. I'm so busy making and designing for others, that I'm sad to say our own walls are not what they could be! But we're well on our way to changing all that. The general mood I've been wanting to create in our living space is energetic (in an inspiring way, not a frenetic one) and fun. One project I've had in mind for a while is based on simple pattern theory, which I planned to subversively personalize. I had this whole print completed in a couple of hours, start to printed version! I started with a simple stamp pad and paper. Our little girl started us off, patterning her index finger print in a daisy pattern. This was the final work, exactly as I'd hoped for! From here, I got busy with some digital imaging tricks. 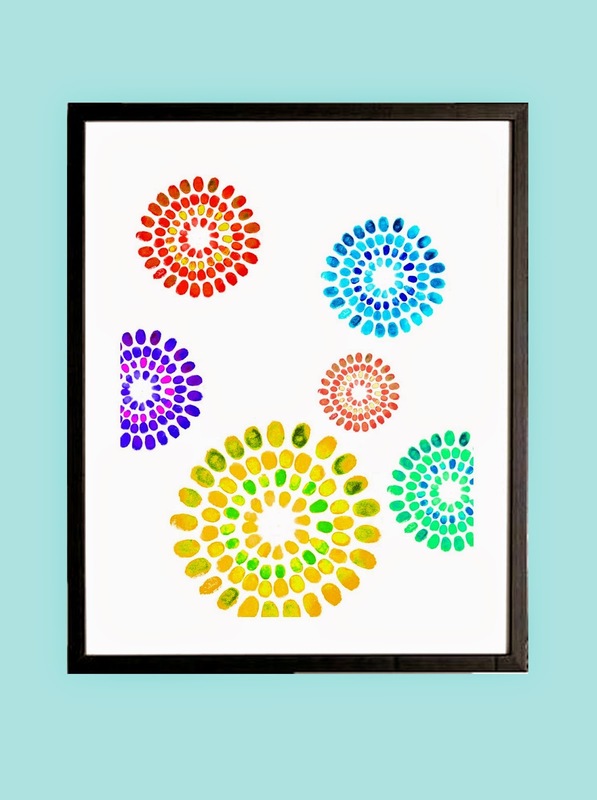 After scanning our "family fingerprint flower", I quickly altered the hue, size and placement of the original, creating a unique and very meaningful piece of art. Since we framed and hung the creation, our kids have been taking delighted ownership in the making of this. They recognize their prints and ours, and love to tell the story of how we made it together to anyone who cares to listen! So satisfying to be able to say I helped make something for US for a change! I LOVE that pattern. Amazing and unique piece of art! Thanks Marieken! The building framed next to the fingerprints is a library in Vancouver called the Carnegie. The photo was taken in 1911 back when the area there was very different than it is now. The library still stands today but the area is rather downtrodden - definitely not the best area in town :( Vancouverites recognize the architecture of the building though, which makes it relevant to us! What a great idea! The finished product is beautiful! I love this. So fun and colorful, and meaningful too.